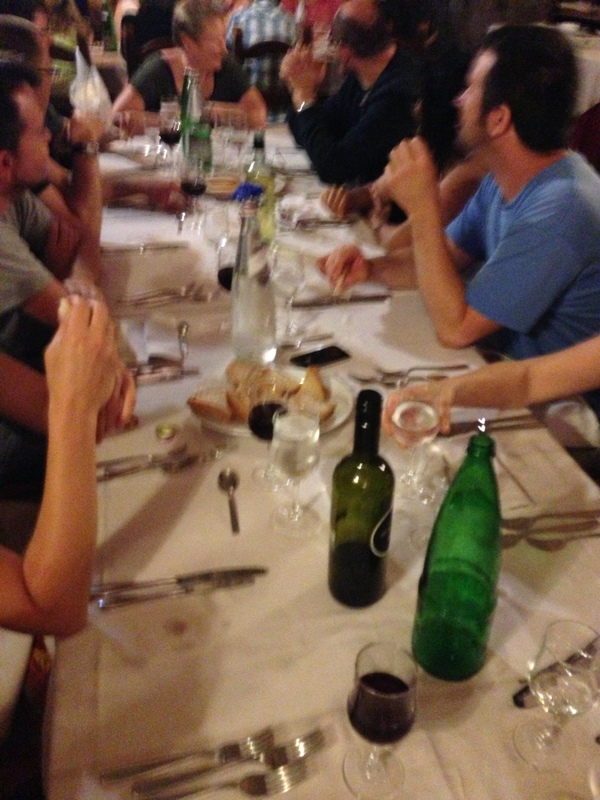 Before heading off to Bolsena, and breaking into working groups of three, we gathered at the Villa Benedetta in Rome. I am surrounded by 23 scholars with a deep commitment to economic possibility and a rich diversity of interests. Wendy Harcourt is our local host/academic participant. She leads us to a restaurant a few blocks from the hotel where we introduce ourselves, get to know each other and/or get reacquainted over a seven course dinner, bottomless cups of wine and jovial conversation. Boone Shear and Claire Brault are sitting on either side of me. Boone is an anthropologist who works with radical organizations on non-capitalist development in New England. Claire is a political scientist and theorist busy developing a theory of uchronia and translating The End of Capitalism into French. The introduction to the French translation is her project for the retreat. Seated across from me is Sonja Capello, whom I just met. If memory serves, Sonja is geographer working on food sustainability and climate change issues in Africa–Mozambique. She is completing a post doc at the Hague with Wendy Harcourt (I think they’re finishing a book together). Oona Morrow, another geographer, is next to Sonja. Among other things, Oona researchers Urban Homesteading in Boston. During the retreat, she is working on a book chapter about social reproduction, co-authored with Kelly Dombroski who has done research in China, Indonesia and Australia. Katherine Gibson and some 16 other Community Economies scholars with fascinating research projects are seated at this long table, talking, laughing and toasting. In preparation for the retreat, we all read 21 abstracts submitted by fellow participants so we knew a little about what everyone was working on. Topics of conversation range from diverse economies to diverse loved ones; the projects we are working on, what we’re excited about and where we are stuck. The courses and wine keep coming. We talk about about our working groups and share initial impressions of the projects and the prospects of the retreat. This entry was posted in Julie Graham Community Economies Theory and Writing Retreat in Bolsena Italy, Uncategorized and tagged Community Economies, Janelle Cornwell by Janelle Cornwell. Bookmark the permalink.